Um, it's not exactly MY style, but I gotta admit, it's well done. Wow! That 'do is amazing! One of the little guys getting a late start. He's heading off to school at the City of Refuge Children's Home -- high in the Blue Mountains of Jamaica. I'll bet you know someone in the armed services. If you get a chance, give them a big hug or a big, firm, heartfelt handshake. And while you're at it, thank them for our freedom. It’s a shame that this beautiful creature has such a bad reputation, but they work hard to earn it. My friend, Ron, reminded me of our mutual love of silhouettes. 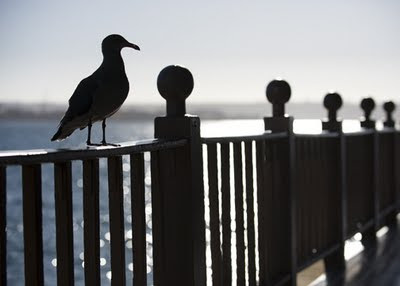 Coincidently, I shot this frame yesterday overlooking San Diego Bay. This Gull had an eye for my fish and chips, but I wasn't givin' in. This was the view from my taxi window around noon today. 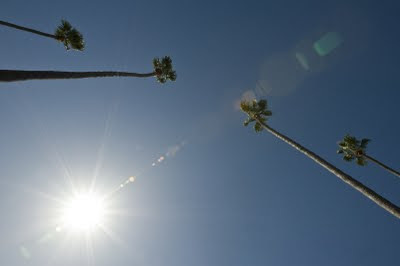 I've been in San Diego a number of times in my life and every single day I've been here, it's been sunny and 70 degrees. I've been here in the winter - Sunny and 70. I've been here in the summer - Sunny and 70. And today? Sunny and 70...and not a cloud. Sunny and 70 never gets old to me. By the way, I love shooting into the sun. Many people are afraid to do it (sunsets don't count). I'm not sure why. Give it a try. If you're shooting people, just add some fill flash. In photography it's good to learn the rules, but don't be afraid to break them. It may set you apart from the herd. My clients don't hire me because I shoot like everybody else and follow all the rules. I snapped this photo no more than twenty minutes ago. This dude (or dudette) was lounging on our sidewalk about ten feet from our front door. I got on my belly and slowly made my way closer, closer, closer, never making any radical moves. Before I was finished, the front of my lens was about 18" from his head. He never acted threatened. He was about two feet long. He's right here. Reunited with his sister. We're delighted to have him. Actually, we're delighted to have them both. Is it easy having two dogs? No. It involves extra work. There are plenty of people that think we're nuts. People that know me well, know that I don't necessarily do things because they're easy. Making my life cushy and quiet is of no interest to me. I knew this morning was going to be a good one. My friend Mark sent me a note last night to let me know that he and some friends would be lifting off about 1 mile from my house at 7:00 a.m. He keeps me in the loop because he knows how much I enjoy seeing these majestic, gravity-defying beauties. I have had the good fortune of flying in a hot-air balloon before and if I hadn't, it would be on my "bucket list". It's an incredible experience. You can call him what you like. And they may say he's a West Indian Iguana, but to me he's a mini-dinosaur. Come on. Look at that dude. He's got D I N O S A U R written all over his face. These guys are four to seven feet long and they typically live high in the trees unless they are on the ground looking for food or sunning themselves. We were in the US Virgin Islands on the island of St. John when I snapped this. He was about 30' from our hotel room patio. They're as common as squirrels on many islands in the Caribbean.